Cleaning the kitchen, bathroom or laundry? Multi-purpose cleaners are designed to be used on multiple types of surfaces, meaning you don’t need a specific cleaner for a specific area of your home. We tested a range of spray cleaners to see how well they removed greasy soil. Bottom line: This multi-purpose cleaner does a poor job at cleaning and costs 6¢ per application. Bottom line: This multi-purpose cleaner does a good job at cleaning and costs 2¢ per application. Bottom line: This multi-purpose cleaner does a very good job at cleaning and is expensive at 11¢ per application. Bottom line: This multi-purpose cleaner does a poor job at cleaning and costs 5¢ per application. Bottom line: This multi-purpose cleaner does an only just OK job at cleaning and costs 6¢ per application. Bottom line: This multi-purpose cleaner does a poor job at cleaning and costs 3¢ per application. Bottom line: Water does a poor job at cleaning, but is free out of the tap. Bottom line: This multi-purpose cleaner does an excellent job at cleaning and costs 2¢ per application. Bottom line: This multi-purpose cleaner does an excellent job at cleaning and costs 8¢ per application. Bottom line: This multi-purpose cleaner does an OK job at cleaning and costs 5¢ per application. Whenever using a cleaner for the first time, check it’s safe for your surfaces. Follow the instructions on the label and spray a small amount the size of a coin onto the surface you want to clean (do this in an area where it won’t matter if it gets damaged). Wait a few hours to see if the product harms the surface. “Natural” doesn’t mean safe. “Natural” ingredients, even fragrances, can be harmful. Always keep your cleaners away from children — ideally in a high or locked cupboard. If anyone swallows cleaning product, immediately rinse out their mouth with water and phone your doctor or the National Poisons Centre (0800 POISON). Most multi-purpose cleaners shouldn’t be used on metals or unfinished surfaces. Always check the pack to see which other surfaces should be avoided – we found a wide variety of “unsafe” surfaces listed. 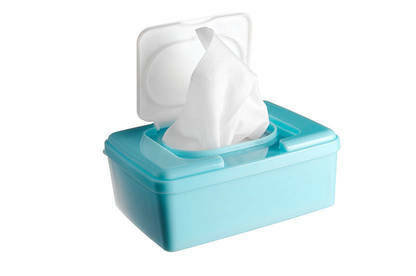 Pre-treated cleaning wipes have become more prevalent in the cleaning aisle. They’re easy to use, the packs are generally resealable, and there’s little mess. But they aren't environmentally friendly, and our previous test found wipes consistently performed worse than spray cleaners. Three wipes in the previous test garnered 3 of the lowest scores and we made them “don’t buys”. We also found they often performed much worse than sprays of the same brand and they’re less economical. The wipes we tested came in packs of 36 or 40 and cost an average of 13¢ per wipe. In comparison, the spray cleaners we tested have, on average, 584 sprays per bottle. So, for example, if you use 5 sprays to clean an area, such as your kitchen bench, it’ll only cost 6¢ and you’d have an average of just under 117 applications per bottle. You should never flush wipes down the toilet, even if they state they are flushable. Our previous testing of wipes found “flushable” ones don’t break down as readily as claimed. None of the wipes in our test claimed to be flushable. Pour some vinegar into a spray bottle. They’re available from supermarkets, hardware stores and garden centres, or you can re-use a clean bottle. Make sure to clearly mark it as vinegar or cleaner and keep it out of reach of children. We recommend storing the baking soda in an air-tight container, like a spice shaker. This makes it easier to apply and being air-tight means the baking soda won’t absorb moisture from the air. We also suggest having a second spray bottle of water, for rinsing off after cleaning. For each tile, sprinkle a small amount of baking soda (about ¼ of a teaspoon) on the area to be cleaned. Spray a few sprays of vinegar (about 3 teaspoons worth). Once the baking soda starts foaming, scrub the surface. Rinse with water and wipe with a clean cloth. For each tile, sprinkle the baking soda on a cloth. Spray a few sprays of vinegar onto the cloth and immediately start cleaning the tile. Don’t use malt or red wine vinegar. White wine vinegar won’t stain any surfaces, but other vinegars might. Don’t pre-mix the ingredients. The baking soda will dilute in the vinegar mixture, its effervescence will be lost and you’ll probably recreate that school science experiment of making a volcano. 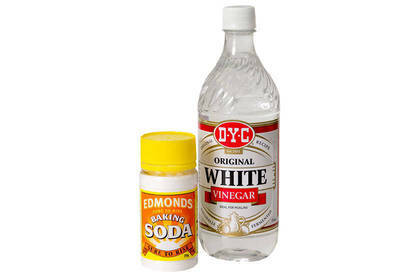 There are a few theories about why baking soda and vinegar works as a cleaning agent. When they are combined, the resulting chemical reaction produces water, carbon dioxide and sodium acetate. Its cleaning ability may be due to bubbling from carbon dioxide being released, the extra water being produced, the abrasive nature of the mixture, or a combination of all 3. But, however it works, it does. Most cleaners are designed to leave a pleasant smell. Our home-made cleaner had an obvious vinegar fragrance, but you can mask it by adding ingredients such as citrus juice, vanilla or an essential oil. We tried all of these and found adding citrus juice worked the best (we used lemon). However, adding anything to the mixture affects how well it cleans, so try a test batch first. We list some of the claims made on the packaging of multi-purpose cleaners but haven’t tested them. Surfactants can have adverse effects on the environment, but “biodegradable” ones will break down and have little effect. There is an Australian standard, AS4351, some manufacturers may follow but this only applies to surfactants. There are no guarantees the other ingredients are biodegradable. If you have a septic tank, it can be hard finding household cleaners that are safe to flush down the drain. Cleaners can contain harsh chemicals that can damage a septic tank. 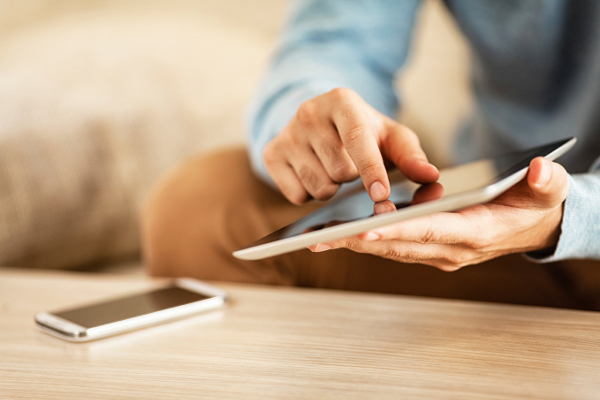 We suggest contacting your septic tank manufacturer to see what it recommends. This means the waste, or “grey”, water is safe for other uses, such as watering the garden. If you are using grey water in your garden, we suggest not using it on food that will be eaten raw. Some cleaners state they kill a certain percentage of bacteria, but there is little evidence antibacterial cleaners stop the spread of bacteria in a home. There is even the risk they contribute to antibiotic resistance in the environment. This claim may only apply to some ingredients in the cleaner, and may not mean the entire product is made from plant-based products. There’s no standard against which to measure these claims. Usually listed on laundry detergents, this claim is best accompanied by a minimum phosphate percentage. 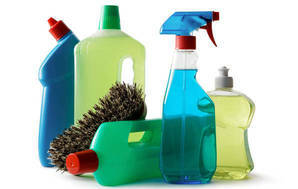 See our article on green cleaning products for more about phosphates in dishwashing liquids. White tiles are covered in a greasy soil and, following the manufacturer’s instructions on applying the cleaner, we used a mechanical arm to clean the tile. The tile’s cleanliness is then checked with a spectrophotometer. The test is repeated 8 times and the results are averaged. Where instructions stated, we applied the cleaner to the tile and left it for the designated time before scrubbing the tile clean. Not all cleaners had application directions. In those cases, we applied the cleaner to a damp sponge before placing the sponge on the tile and scrubbing the tile clean. How does a cleaner score worse than water? Yes, water did better than some of the products we bought off the shelf. This is because they acted more as lubricants, reducing the effectiveness of the mechanical scrubbing action and shifting the grime around rather than removing it.